Leading Intelligent Transport Systems (ITS) provider in South Africa and Africa, TSA International (TSA) uses state-of-the-art and innovative technologies in its projects & solutions. Customers receive up-to-date information in real time with the ability to utilize the information optimizing delivery to all stakeholders. TSA Provides the platform to acquire and communicate event data reliably and accurately in real-time reducing data inaccuracies, operational costs and theft of assets resulting in an increase in service level performance. In 1995, Durban-based entrepreneur Glen Pillay established Traffic Signals and Accessories (TSA), aiming to produce a reliable and cost-effective range of traffic signal lights. In so doing TSA began to delve into corporate development which was previously uncharted by a Black Empowerment Enterprise. TSA has since evolved into a transport solutions company offering turnkey solutions in vehicle data collection, law enforcement, street lighting, and variable message signage with the focus being on environmental awareness. TSA prides itself as being a company with a history rich in service, innovation and continuing growth. TSA has always provided employment to the local communities. Empowering of staff is done during formal training sessions both on-site and off. Outside expertise is called upon if deemed necessary. Besides being trained in their specific fields, staff is also trained in First Aid, Health and Safety, Fire Fighting and Computer Literacy. TSA ensures that staff is continually empowered with the latest development within the industry, thereby contributing positively to the daily operations within the organisation. Academics - Sponsorship of computers, library books, media resources,literary support Programmes and competitions. Infrastructure - Refurbishment of school buildings and grounds. School Nutritional Schemes - Provision of school lunches for impoverished learners. Contributor to Traffic Education Campaigns. Regular Sponsor of Child and Family Welfare Societies. Regular sponsor of Religious and Cultural Organisations. Provider of training to the physically challenged community. 84 Columbine Place, Durban, KZN, South Africa. Staffing: In excess of 100. Ranked amongst the top 3 traffic management companies in Southern Africa. Largest manufacturer and supplier of LED traffic lights in Africa. 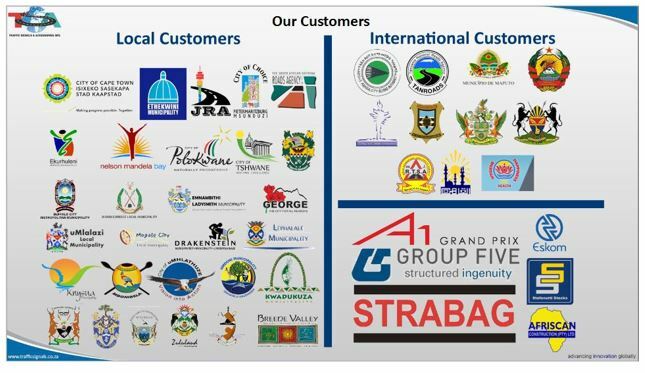 Agents throughout South Africa, Mozambique, Zambia, Zimbabwe, Namibia, Botswana, Ethiopia, Malaysia and India. TSA's infrastructure ensures that the company is at the forefront of technological advancement, and has expanded to the point that it possesses an unprecedented range of services. These facilities include manufacturing, sales & marketing, installation, maintenance & consulting. To empower countries, corporations and municipalities with intelligent transport solutions through innovative quality products and services. We're here to help answer your questions. Matters can be complicated, our experts are on hand to help inform you of every aspect regarding your topic. We take great pride in using our expertise for you and look forward to hearing from you.